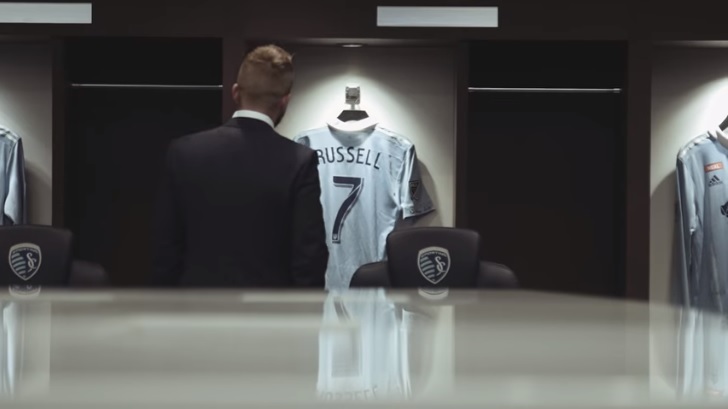 In his first year of Major League Soccer, erstwhile Derby County winger Johnny Russell was a resounding hit, as two-time MLS Cup winners Sporting Kansas City nearly went all the way again. A creative and scoring force in 2018, the Scottish international is set to return with the same infectious vigour for season two, though there may soon be some brand-new strings to his bonny bow. For a certain few, that over five years have passed since Sporting Kansas City’s 7-6 MLS Cup shootout win over Real Salt Lake takes some believing. The sight of Lovel Palmer’s effort cannoning back off the crossbar, with SKC keeper Jimmy Nielsen’s arms held triumphantly aloft to officially rubber-stamp the second championship in club history, is just as crisp today. Last season was the closest they have come since, and although the final two hurdles eluded Peter Vermes’ charges, the beaten Conference Finalists left more than a mark, topping the Western Conference by three points and setting a number of new club records over the year. It is hard to deny there has been a void since now-U.S. international Dom Dwyer left for Orlando City in July 2017, with such game-winning X factor so widely coveted, but in another British-born attacking talent last year they found it again. A young star at Dundee United, Johnny Russell’s near-five-year spell south of the border with Derby County brought a double-century of games, increased recognition, so very nearly a Premier League return for the Rams, and one superb strike in a never-to-be-forgotten 5-0 trouncing of bitter rivals Nottingham Forest. By his own admission, however, the Scotland international had needed to find the feeling for it all again, and after starting to unearth the enjoyment last season, he swapped East Midlands for Midwest. Kansas City has so far proved the place to recapture what he does best, along with ushering in the fresh and new. Suffice to say, the Coatbridge native had not quite been treated to ‘Russellmania’ before; an extremely impressive personalised tifo unveiled by Sporting devotees, The Cauldron, in his honour before September’s game with Real Salt Lake. As the days trickle away ahead of MLS’ 24th season, SKC’s much-loved number seven will of course be targeting more of the same form that saw him hit double figures in both goals and assists. There is, though, another little ambition in his thoughts for this calendar year, as he reveals. “Music’s always been something that I’ve loved. I’ve always got it on, whether I’m in the car, in the gym, changing room, in the house. “There’s always some sort of music on, and I think this year, I am gonna try and take up an instrument as well, just in my spare time at night. I think I’m gonna go for the guitar. “I’ve played with a couple of guys who’ve been really good at it; (former Dundee United teammate) Gary Mackay-Steven was brilliant on it. For music being so much in my life, I think it’s only right that I try and learn. With a further two goals and two assists in Open Cup play, Johnny weaved his way into SKC record books in becoming only the fourth player in club history (after Preki, Benny Feilhaber and Josh Wolff) to register ten goals and ten assists in a regular season. Performing at your best seems all the more attainable if there is some vital off-field contentment, and to look at Johnny’s sizzling form in 2018, you would assume he had long been a settled Kansas City resident. He admits his relocation has not been without its challenges, but it has been aided supremely by a love for his environment. “I wouldn’t say it’s been overwhelming. I know it’s not a great distance but even in Derby I was away from family, so I’ve always kind of lived away. “It’s just something I’ve managed to get used to over the years. Obviously, there’s moments and there’s times that it’s only natural you miss certain things. “You always miss your family but it’s just something where it was my decision to come here, and I knew it was going to be difficult in that sense, but it’s just something that you have to get on with. I’m loving it here. “It is difficult not seeing them as much, because I’ve got nieces, and my daughter’s over here with me, so my family don’t get to see her as much as they would like. Even now in pre-season (in Arizona), my wife and my daughter are still back in Scotland, so it’ll be like seven weeks since the time I started until the time I see them. With those prolonged periods before being reunited with loved ones, it is guaranteed to be testing, though music has a hand to lend in such moments, given its seemingly supernatural powers of warmth and nostalgia. Aside from the moments of personal focus that plenty opt to make time for on a game day, the locker-room energy and familiarity offers its own sanctuary. At Sporting, much like the goals, the musical flavour can come from various corners, though it is often led by a Hungarian attacking counterpart Johnny has struck up a heartening rapport with. “It’s just usually whoever gets there first, so Dániel Sallói, he plays a lot. A couple of the Latino guys usually get their hands on it as well, but when they get on it it’s just really Latin music, so only they really know what’s going on! “So, Dániel, and like Felipe Gutiérrez, they get on it quite a lot. Bes as well actually, Matt Besler; he goes for sort of old-school r&b, so that’s a nice chilled-out one. Matt Besler was the most recent SKC player to feature on here, back in 2015, and the captain’s choices fall neatly in line with Johnny’s most favoured selections. “I’m mainly an r&b kind of guy; r&b/soul music. Favourite artists: Chris Brown is one, but it depends what kind of mood I’m in. “If I’m just chilling out, I like Daniel Caesar, I love J. Cole as well. If I’m trying to get myself up for a game, it’s usually a bit of rap that I would put on; J. Cole, Eminem, something that would get me a bit fired up. As he touches on, the polished Paisley vocals of Paolo Nutini help Johnny hold on to some homeland feels, despite the 4000-mile gap. The 28-year-old wideman earned a recall to the senior Scotland side last season under the returning Alex McLeish, featuring in their successful UEFA Nations League C Group 1 campaign, as well as in friendlies with Mexico (at the Estadio Azteca, no less) and Belgium. His first cap had come against England in November 2014, as he came on late to set up Andy Robertson’s goal in the 3-1 friendly loss at Celtic Park. 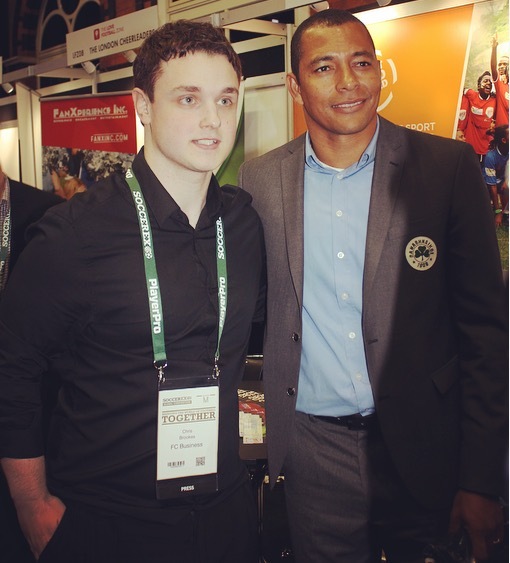 The venue had meant yet more significance to Johnny, who grew up a Celtic fan, with Swede sensation Henrik Larsson enjoying hero status with him (and tens of thousands of others). After Sporting KC’s 3-0 home win over Portland Timbers in August, in which he struck the third, he gave an ecstatic young fan his shirt after she had held up a message during the game telling Johnny it was her 9th birthday. This ‘first CD’ question takes us back to when Johnny was the nine-year-old, so does he remember the first he ever bought? “I do – couple of classics! I bought ‘Mambo No. 5’ (Lou Bega’s) album and Shania Twain’s album! “It was then sort of round about that age my cousin was really into r&b and rap, so that’s what got me into it, just listening a lot with him. So, growing up, I got introduced to people like 2Pac really early…which probably isn’t great for somebody growing up! With the Azteca, Hampden, Celtic Park, Ibrox and Wembley among the arenas Johnny has turned out at in his career – Children’s Mercy Park too of course – sometimes it is good to slip back over to the other side for a little while. So, if he could be in the crowd to see any band or artist, from all-time, perform, he knows just who ‘All Eyez’ would be on. With music typically sewn into the tapestry of friendships and family memories, that is undoubtedly true for Johnny, who recalls how it had a role to play in a very special time. “On my honeymoon I actually went to see Bryson Tiller and Fabolous in Miami. That was just sort of spur of the moment; we didn’t know it was on. “I love Bryson Tiller as well, so I found out he was on and we went to that. The most recent one I went to, I actually drove to St. Louis to watch Chris Brown; because of the UK ban I’ve not seen him perform for years. Before Bryson Tiller, it was Craig Bryson. ‘True to Self’ artist Tiller may have claimed a sizeable section of the honeymoon soundtrack, but midfield man and fellow Scot Craig Bryson was the one who took top billing on one of the brightest ever days in Johnny’s career. Bryson’s hat-trick helped sink the old enemy on an early Saturday afternoon at Pride Park in March 2014, as Derby hammered Nottingham Forest (and their old manager Billy Davies) 5-0 in one of the Championship’s most startling results of the season. With Irishman Jeff Hendrick also on the scoresheet, Johnny hit a sensational fourth on 53 minutes, cutting sweetly across a left-footer from outside the box as Steve McLaren’s Rams ran riot in front of the Sky cameras. That group still evokes the fondest of memories for Johnny, and it was one that came within a game of returning the club to the Premier League that season. The Rams were denied at Wembley in the cruelest of circumstances, as Bobby Zamora struck at the death to hand ten-man Queens Park Rangers a play-off final Derby had been dominating. When it comes to the sounds from those years, a player who joined Derby in Johnny’s third season remains the main mixmaster in his memory. “It was mainly Bradley Johnson who did it; he was a good DJ. Most of us all loved the same sort of music, so it was pretty easy to do the playlist. Despite the heart-wrenching conclusion, there is little wonder Johnny’s debut year in Derbyshire was so enjoyable. Not even champions Leicester City managed to match Derby for goals that season, as they came up with 84, and a further six in the play-off semi-final legs with Brighton. Johnny, who hit nine himself in 2013/14, recalls how they had set it off in memorable fashion even before the competitive action came around. “I’ve done an initiation everywhere I went. At Derby, I sang in pre-season. “We had a team meal, but we were right down the bottom of England, so where we were based, we were going out for a team meal, but we had to get a boat to the restaurant. It was like a little wooden restaurant out in the water; it was beautiful. “They made us get on the mic on the boat and sing; there was like eight of us who sang. It was actually a really good standard; probably one of the best standards I’ve seen. “I sang ‘Candy’ by Paolo Nutini. Chris Martin sang the song from Anchorman, when they all sing it together. “Big Lee Grant sang ‘This is How We Do It’ (Montell Jordan). It was a good experience, that one, it was funny. Johnny says he is more than happy to have dodged an initiation with Scotland, some five years on from his senior bow with the Tartan Army. However, what if he had to not just slip into vocal mode again, but go a step further and actually record a track? With any teammate (or multiple) from his career to join him, either to enhance the quality or guarantee the fun, he has a think of how this very unique scenario might play out. “That’s a good one. I’m trying to think who’s been the better singers. “Probably Jaylin Lindsey, one of the young kids here. He sang his initiation last year but we got him back up when all the new guys did their initiation a few nights ago. Sporting boss Peter Vermes paid tribute to Johnny’s physical and mental toughness last year, and the longest-serving head coach in MLS must have been especially enthused by the frequent sight of him driving at players without hesitation, scoring and assisting one after another. There was even a front-flip celebration in there that Miroslav Klose, Pierre-Emerick Aubameyang and company would be highly delighted with themselves. His April hat-trick at home to Vancouver Whitecaps came in a 6-0 win and made him just the eighth player in club history to score a regular-season treble. Even more impressively, he did it in 48 minutes, making him the quickest to do so. The pieces were very evidently in place on the field, but Johnny offers some insight into the set-up he has enjoyed off it since he arrived. “I was staying in an apartment, just for a few months until I found a house. I’ve just moved outside of the city now, but when I was down there everyone said ‘you have to try the barbecue,’ so that’s something I did. 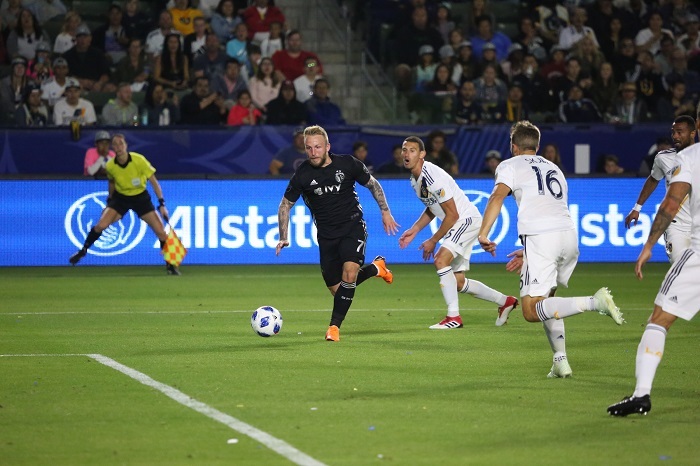 Moments like the solo effort Johnny came up with in last April’s 2-0 victory at LA Galaxy, as he jinked between two defenders before digging out a deft finish, indicated he was a player fully back in the groove. It is true, though, that he had felt decidedly out of kilter for a time. After Derby were beaten 3-2 on aggregate by Hull City in the 2016 Championship play-off semis, Johnny deemed the following campaign his worst in football, though his winner at home to Leeds shortly after Steve McLaren’s return as manager was a personal highlight. He says he had begun to let it get to him when his creative endeavour was not paying off during games, resulting in him losing the willingness to try it, but the spark duly did return. Expressing his adoration for scoring goals when he arrived at Derby, Johnny left on a high note in that regard, with his fifth strike of 2017/18 in a Rams shirt coming in a 3-0 January success at Birmingham City in his penultimate game. The team went on to make the play-offs under Gary Rowett, ultimately beaten in the semi-final by promotion-winning Fulham. Johnny remains popular with the Derby faithful, and while he enjoyed some of his favourite moments of his career with the club, for fans watching, they were moments they match to their own lives as well; be it that late winner that sparked carnage for them and their friends and family, or the time they can remember feeling there was good reason to dream again. While keen to speak positively about his time there overall, Johnny details why the earliest campaign sits that little bit higher in his affections as he looks back. “If I can pick a year, my first year would probably be the happiest. I think the team that we had, the group of guys that we had as well, everyone was young, hungry, with something to prove, and I think we proved a lot of people wrong that year. “We played some of the best football that I’ve played personally, and team-wise as well, in my career. So, definitely that first year, but every year was great. It should be noted that Johnny joined Derby from another club with a proud European football past – 1987 UEFA Cup finalists and 1984 European Cup semi-finalists Dundee United. Making his debut as a 17-year-old at Falkirk in May 2007, he did not make his breakthrough in earnest until the 2010/11 season, having served his first-team apprenticeships out on loan at Forfar (twice) and Raith Rovers. Back with the Tangerines, his prominence was growing steadily, and in his three seasons in the first team at Tannadice, he scored nine, 15 and 20 goals. There would be a pair of 4th-place Scottish Premier League finishes under Peter Houston, with Europa League qualifiers too, meaning Johnny will not be entirely new to continental club competition when the CONCACAF Champions League games with Toluca come around shortly. Johnny’s teammates included goal-getting Irishman Jon Daly, the aforementioned former Celtic winger Gary Mackay-Steven, and current Southampton midfielder Stuart Armstrong, to name but three. Much of his grounding in the game was gained at the club, and they are years he will not forget. “I loved it there. I signed there at 13 and left there at 23, so a huge chunk of my career was there. “I learned everything there, I had great coaches and teammates around me, so I always look back on how much I did enjoy my time there. Obviously, I felt that I just had to try something new; at the age I was getting to I just wanted to go and try something different. Players and coaches from the UK and Ireland have long since populated MLS through the years, yet the league undoubtedly still presents something of an unfamiliar proposition for newcomers. D.C. United’s Wayne Rooney was most definitely not the first to be somewhat taken aback by the post-game media presence in the locker room last year (though he was probably slightly more surprised at receiving a guitar for one Man of the Match display..). The grueling travel is one factor that overseas MLS critics handily seem to skim over, with differing timezones, climates and even altitude to contend with at points during the season. Then there is something no British native is safe from – the high-level threat to their accent. Johnny has managed to safeguard his from modification so far. “Obviously, there’s certain words that you pick up here and there, but I think going back home for Christmas and New Year, when I’ve came back (to the U.S.), the guys have said ‘your accent’s got worse!’ Well, worse for them. Upon crossing the Atlantic, Johnny highlighted his desire to win silverware. He stressed how much he did not want to rest on his laurels, and his form certainly attested to that. MLS’ format of course means that the most consistent regular-season team may not even still be around when the championship showdown arrives in December. Regardless, Sporting do appear to be a team constructing the vital pieces, so why not a ‘2019’ to go alongside ‘2000’ and ‘2013’? Named in the MLS Cup Playoffs Best XI alongside teammate Matt Besler, Johnny surpassed a century of career goals last year, something even some ‘out-and-out’ forward players do not achieve before they hang up their boots for good. He still has a couple more months of being 28 to run, but as a player and personality who has by now seen his fair share in the game, what does he think it has all taught him? “You know what? I’ve never actually thought about that. “Probably the main one is just to appreciate and try and enjoy, especially going through some tough times where I wasn’t happy, I wasn’t enjoying what I was doing. It’s a huge honour to be doing what I’m doing. “Obviously, there’s a lot of hard work and a lot of things that you need to put aside and miss, but it’s a privilege to do what you do for a living, so you just have to try and appreciate it and enjoy every day as much as you can. You just have to look at some of the things that have happened recently to see that it can be taken away in a second. After a slightly shortened pre-season last time around, Johnny has been with the team from the off this year, and if 2018 is anything to go by then Sporting fans have a lot to look forward to from their flying Scotsman and his comrades. Opening day for SKC is Sunday 3rd March, at LAFC’s Banc of California Stadium, but before any of that, Johnny is required in this closing scenario. When at his best, he is the kind of player who can take it back to the brilliant simplicity of a kickaround down the park, so he is an ideal candidate to answer this regular final question. The interviewee is asked for four of their career teammates they would like on their team in a small-sided game. They are advised that their selections do not necessarily have to be the outright ‘best’ they have ever played alongside, but more so a worthy sample four from the many they could choose (is that diplomatic enough?)! In Johnny’s game, there are no keepers…or even defenders! He also appears to have given himself a tough decision to make, with one of his team needing to sit out from the beginning. What is guaranteed, however, is no shortage of fun and quality. “I’m just gonna go sheer skill and enjoyment factor here. Gary Mackay-Steven would be in there – just the way he played the game and some of the stuff he would try. “Some of the stuff, you would try it messing around in training, but he used to do it in games, so to play alongside him, it was so fun to watch. Danny Swanson, he was very similar; you couldn’t get near the guy. “Tom Ince, another one. I loved playing with Incey and he’s one of my closest mates now. “Jeff Hendrick, the exact same; absolute machine, one of my best mates as well. They’d be in there.